I have always been a fan of Swensen's ice cream. This should be evident in the amount of blog posts I have written about them within my first year of blogging. 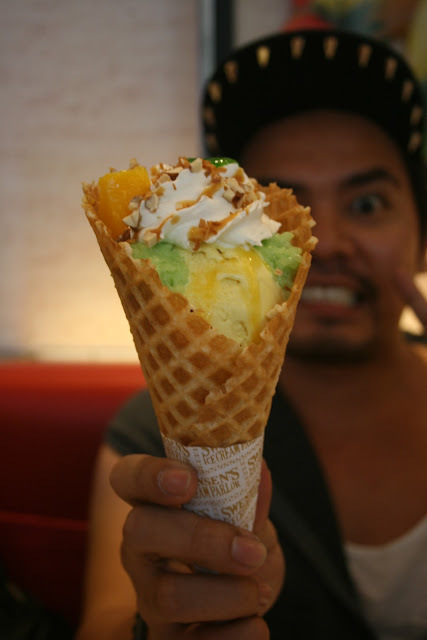 I blogged about Swensen's arrival in the Philippines; there was the Trio date; there was the Scoop-Off event and there was my rainy day post. 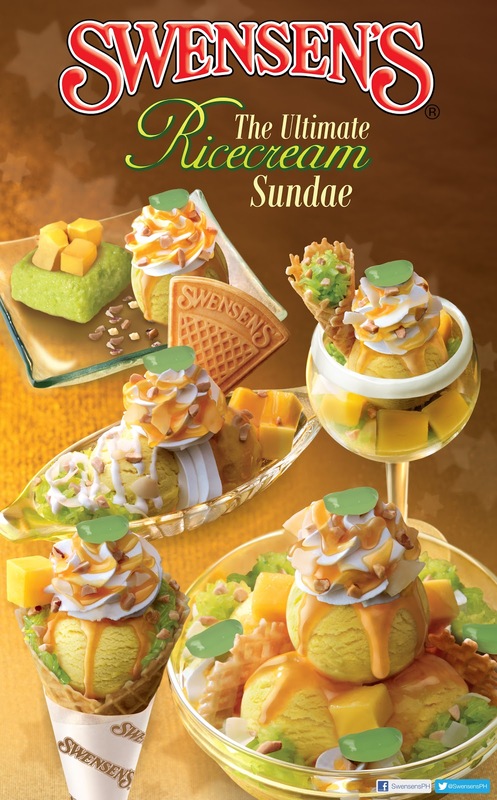 Well, Swensen's hasn't stopped in providing various new sundae choices since then. This holiday season, they are introducing the Ultimate Ricecream Sundaes that are sure to satisfy your tummies like never before. These latest options from Swensen's focus on the all-time Filipino favorites: ripe mango and sticky rice. I was lucky enough to be one of the few to taste these delicious and heavenly concoctions before anybody else last week along with John, Catch and Gerd. My sundae: the Mango Sensation. Catch chose this for me coz it was the girliest of the bunch. :p I'm not too fond of the white stuff pouring out of the glass coz I'm dirty-minded I kept thinking it would drip onto the table and I couldn't touch my ice cream bowl coz of it. 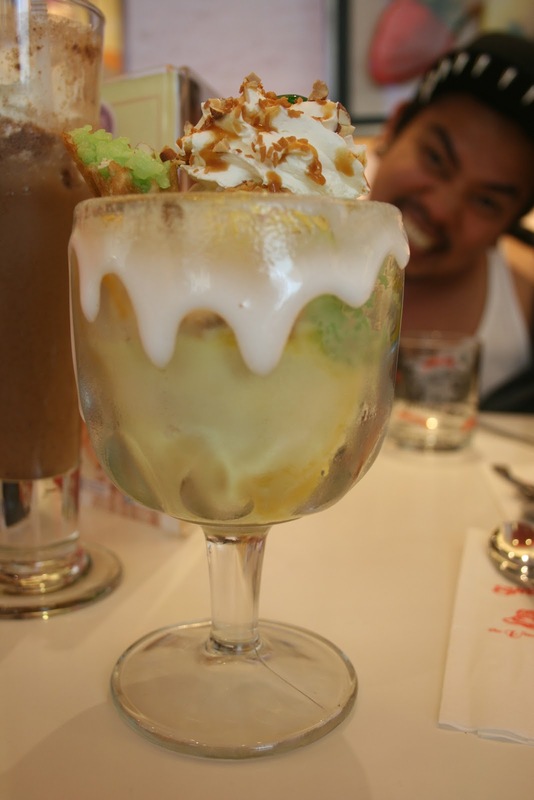 Gerd's sundae: the Mango Hurricane. Always the trooper who eats food meant for sharing, Gerd had this crazy ricecream sundae and actually finished all five scoops of it (give or take)! Catch and I ended up fighting over his leftover sticky rice. That's just how good it was. 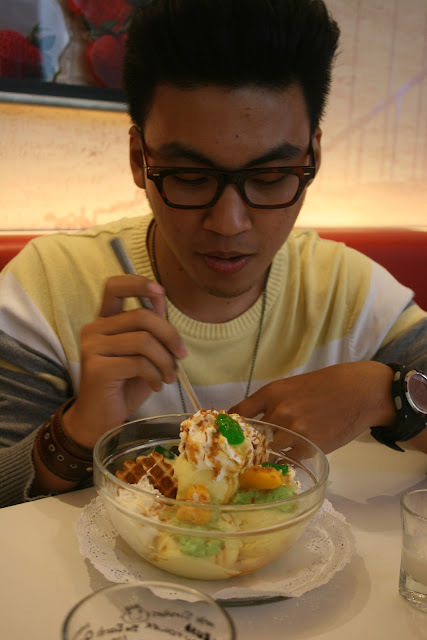 By the time Gerd and I had gotten to Swensen's, Catch and John were already done with their sundaes, but Catch just loves Swensen's so much, he had a second ricecream sundae. True story!